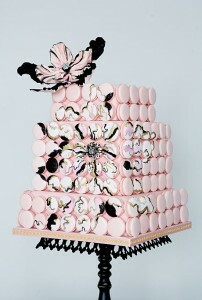 The three tier square cake is covered in light pink fondant and then macarons – some pink and some playing into the abstract art of the peony cake topper. The cake is elegant and very pink – you would have to really love pink for this to be your cake. But somehow it all works. The peony cake topper’s colors play off the pink hue of the cake and the handpainted macarons repeating the peony’s design tie it all together. This pink macron cake won’t work for everyone, but if you can make it work it’ll be a show stopper. We found this cake here. It was created by the Cake Opera Co. in Toronto.